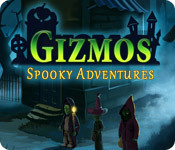 Gizmos: Spooky Adventures is rated 4.2 out of 5 by 18. Rated 5 out of 5 by murphie12211 from Want a Challenge? This series is only for the well-seasoned nanogram player. The grids increase to 30 x 30 with only one color. If you're used to playing the Fantasy-like series, the difference will become evident very early on in the game. Two complaints: 1- the music is very repetitive and annoying. 2- the grid is too small, making it not only difficult to count the squares, but also tiring on the eyes, as well as easy to make mistakes, so I didn't redo any to get an error free score. There is much counting and recounting of these tiny boxes, requiring uninterrupted concentration. I gave up even trying to beat the time limit. Kudos to the developers for creating such complex nanograms that are totally analytical. I won't play a game that requires guessing. While some games drag because of the dialogue, these characters are whimsical and I would have liked more. Superb game for this genre. This is more like a marathon than a stroll in the park. Rated 5 out of 5 by pajutie from Really enjoyed it! This is definitely one of the better picross games. Nothing beats Arizona Rose but this comes close to being on par. 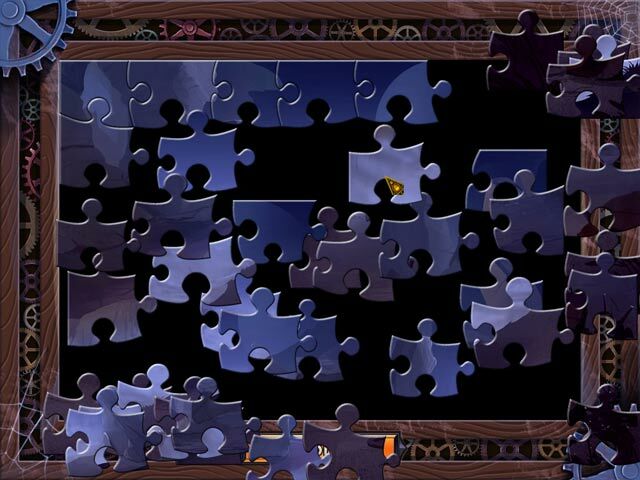 I really enjoyed the occasional jigsaw (prefer them to hidden object games) So sick of Hidden object games. Loved the Halloween/scary characters that revealed after finishing each board. Hope A Christmas one is in the works!!! Rated 5 out of 5 by bjcs319 from Love Gizmo I love the Gizmo games. I hope there are new ones coming out for Thanksgiving and Christmas. Rated 5 out of 5 by Clozar from Great Nonograms(Pictograms) I love playing these. In my old puzzle books they were called Pictograms. I am dating myself. They are a challenge. These are very much so. They even have 30 X 30 squares which I have never played in these games. There is 6 categories with 20 nonograms in each one. Along with a couple of puzzles in each category. If you like this type of game then both the Gizmos games are worth the time and money. Have fun! I am. Rated 5 out of 5 by organistdm from Love the cartoon graphics Long play and great cartoon icons. Love the auto fill option. Thanks! Rated 5 out of 5 by Runrama2 from Great Halloween or Anytime Fun I have bought just about every one of these puzzle games that have come out but this has been the most fun I've had. I consider myself an expert in these games but this has brought interesting challenges. If you like these types of games I would highly recommend you try this one. It runs very smooth. I even like the goofy voices. It's a blast. Rated 5 out of 5 by pennmom36 from Spooky Good Nonograms The citizens of Gizmo Land are really starting to grow on me. 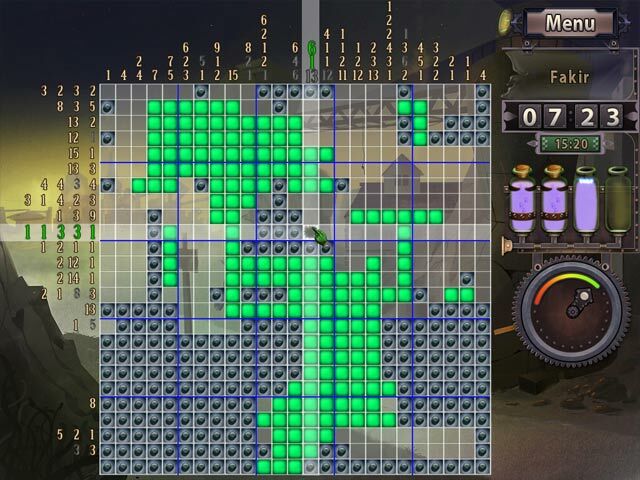 I love the Halloween themes such as Zombies, Jack's Lantern and Mummies that are created by filling in tiles on a grid. The first Gizmos game took me a while to get used to the constant encouragements such as "nice job" and "bullseye" but now I find it comical and actually look forward to the pat on the back I get or an "ouch" if I make a mistake! You have several options to choose full screen or widescreen, auto fill blanks, and you can disable the background images as well as disable the voices. 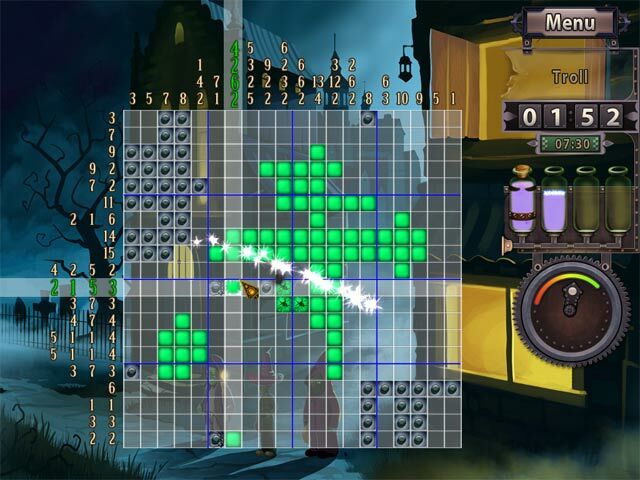 Before each puzzle you will get a brief nanogram TIP, but this can be disabled if they are bothersome. The object of Nonogram puzzles are to correctly fill in the number of tiles as indicated on each row and column, separating each group of filled in tiles with a blank tile. To fill in a tile or cell you use the left click on your mouse and the right click will be used as a blank cell or x. You can click and drag both for filling in large amounts. Every time you correctly fill a tile you will earn energy that will eventually fill in one of four vessels that can be used as hints, filling in several random cells for you. You will receive awards for using no hints, no misclicks (mistakes) solving the puzzle, and solving the puzzle within the perfect time slot. If you haven't played a nonogram, mosaic or picross game, this game is perfect for learning because it has an excellent tutorial and the grids start out with 10 x 10's with easier puzzles to get you started, enjoy! Rated 5 out of 5 by sabinesa from Taking nonograms to the next level I loved the prequel to this one "Gizmos: Riddle of the universe" and will buy this one as soon as I am finished with that one. I like nonograms inbetween playing other type of games for the relaxation, enjoyment, challenge without too much bother and each level being just a few minutes long. In the past the World puzzle series was my favourite in this genre but the last one didn't excite me much, plus I never thought the story line was worth anything in those. Then again, who needs a story line with a nonogram?!?! Now the Gizmo series has a real fun story line and great little characters which I ended up enjoying a lot. What I specifically appreciate is that one can turn off the background picture, which I had to do with both in the series - perhaps that's a bit unfortunate and it would be nice to have a background other than solid greyblack, but the graphics are just too busy and colourful to make the number puzzle still visible enough. One can also turn of the background voices and that's the first thing I did because I don't appreciate somebody saying "not bad" every second move ;) Best though is the autofill option. Now that's really something every nonogram game should offer and has bothered me before in playing this type of game specifically once one gets to the 20x20+ levels. To fill in all the blanks manually is a lass once a row is finished and the autofill does it beautifully - great idea, devs. I enjoy a decent background music in games and liked the one from the first Gizmo better than this one, but that shall not spoil my enjoyment. I am all excited that I'll have another one to go to once I finish the first one. Thanks for a great game! Rated 5 out of 5 by sunnyglow from A NICE SPOOKFEST FOR GRUMPY CAT MONDAY "We're not cowards!" Those of us who love Nonograms, Pic-a-pix, Paint-by-Numbers or as the Japanese call them -"E'Kaki" puzzles are more than delighted to get these from time-to-time. They are not everyone's cup of cider, but everyone should at least try them. "Come fly with me" on Halloween. LOL! Yeah - right! I don't tend to think "fright" guys make very good "flight guys. " Being up there with this group could rather scary! You all had better watch your weight load or you all may end up splattered in the pumpkin patch! You better stick to your broom and bat wings. This is a cartoon delight with very amusing actors with "campy" accents. I am loving it! My only complaint at the jigsaw puzzles. Not really liking them, I guess I will have to "grump" my way along on Grumpy Cat Monday to continue in the puzzle. Thank you BF. You made my day! Rated 5 out of 5 by murphy1923 from Super Nanogram game! I love nanograms and this starts off with 10x10, and just enough challenge to get you in the groove. Jigsaws show up and are a nice break. The only "difficulty" is beating the "perfect time" - but that keeps me interested and on my toes. I wish the boxes were square rather than rectangular but that's a minor quibble. Make is a little harder to count which is what may be slowing me down. The citizens of Gizmo Land find themselves in great danger after an attempt to celebrate Halloween goes very wrong.